Paulette is the subject of the short documentary CaveDigger, directed by Jeffrey Karoff. 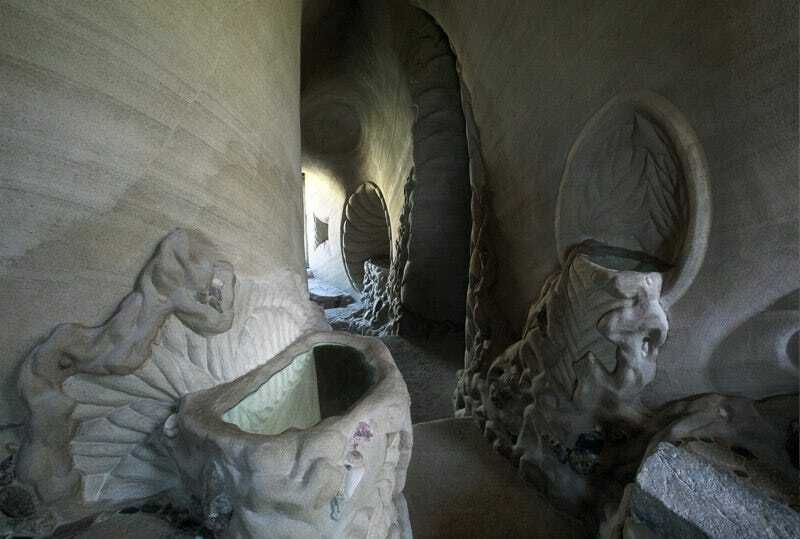 The film examines Paulette's obsessive nature in digging out and carving the caves, his often troubled relationship with his patrons, and his current project, which he believes will be his last. Currently, Paulette is working on a project he calls the "Luminous Caves," a complex into which the sun will shine through multiple windows. He envisions the finished product as "both a shared ecumenical shrine and an otherworldly venue for presentations and performances." CaveDigger has been shortlisted for an Academy Award nomination. You can watch the trailer on Vimeo and read more about the film at its website. In addition to viewing more photos of Paulette's work, I recommend taking a virtual tour of one of his caves, titled "Tree of Human Kindness." It offers a better sense of what it must be like to stand inside one of his art caves than non-panoramic photos can.